Happy Sunday to you! I'm submitting this card for the Simon Says Stamp Wednesday Challenge Anything Goes. I have made this one as part of a package I plan on sending to my two grand daughters with one more to follow. 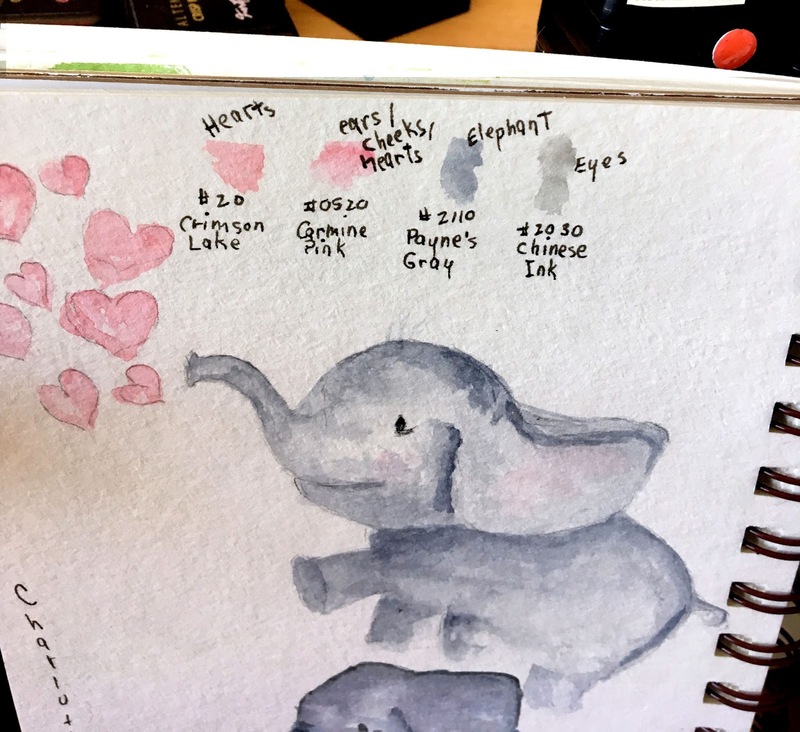 To create this one I used some watercolor paper and stamped the little elephant very faintly and then painted it with a mix of Payne's Gray and Chinese Ink watercolor pencil. I mixed in some pink for the ears and cheeks and used a Micron pen to draw in the eye. 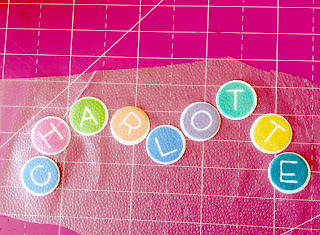 I used a set of alphabet stamps I really love from Lawn Fawn to die cut the circular letters for her name and used Hero Arts Shadow Ink for that. 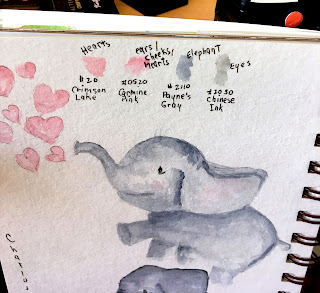 I stamped the 'Sending' in gray and hand drew the little hearts and colored them in with the watercolored pencil paint. I die cut the stitched heart and painted it with the same color as the handrawn hearts and stamped 'Love' in gray to match the rest. To finish it off zI used some border dies to form the side edges and adhered this to a pink card base. Thanks very much for reading this and the materials used are listed below. I also formed the letters in the shape I wanted and slapped a piece of Press & Seal to them to hold the shape I wanted and adhered with some Tombow Mono Multi-Adhesive. This was a draft of what I wanted to create. 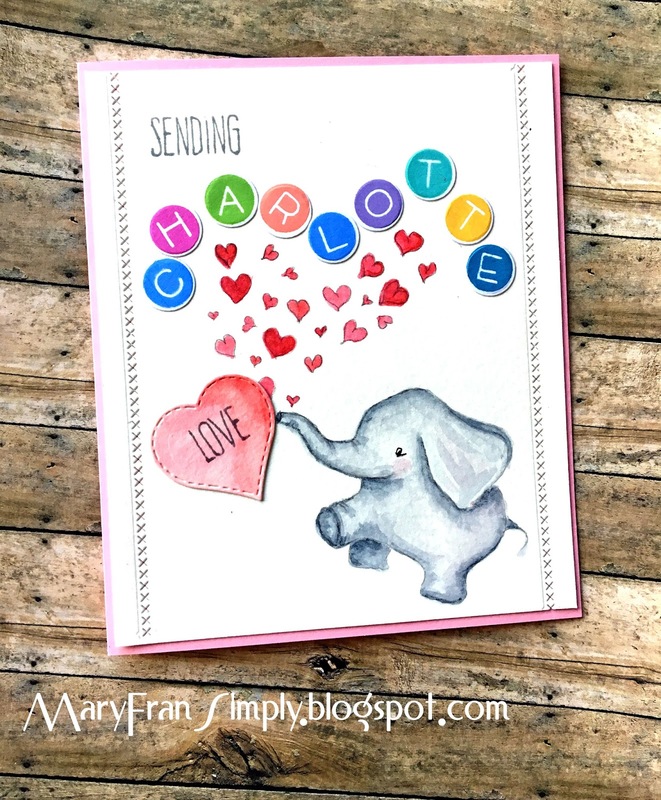 what a fun design, cute card! I am so glad you played along with us at simon says stamp wednesday challenge!